I met Russian foodblogger Katrina from Gastronomicalme a couple of years ago through a food and drink journalism course, and since then I have come to know her as both a passionate foodie and a very good cook. 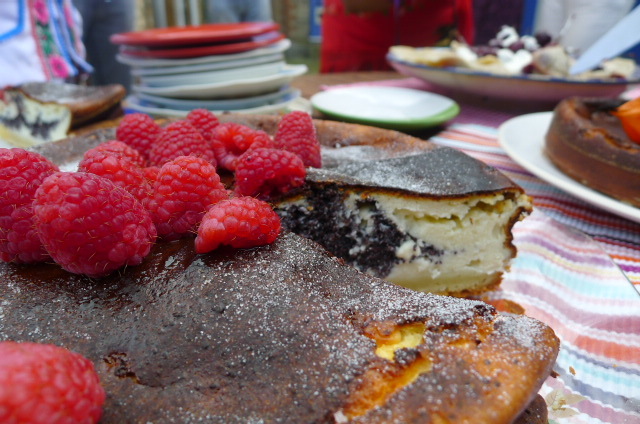 Katrina started organising Russian brunches at her North London home this year and her last event had an added twist to it. The theme was Ukrainian, and she named the event “Eating your way through Ukraine and its lard(er)”. I’ve never eaten Ukrainian food before and so was very excited to explore the tastes of Ukraine. 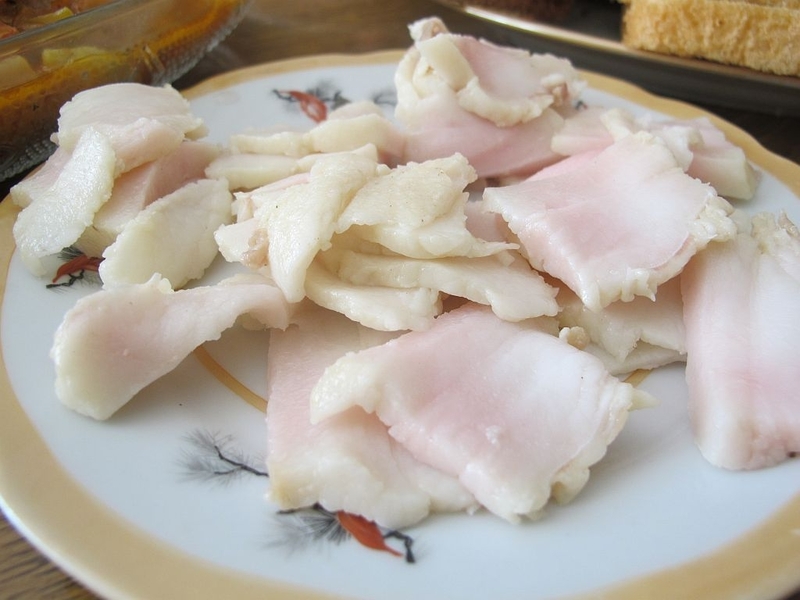 If you know anything about Ukrainian or Eastern European food, you’ll probably have guessed that the reference to ‘lard’ pays homage to salo, cured slabs of fat popular on Ukrainian and Russian tables, etc. Katrina had exclusively hand selected a number of different types of salo from various Ukrainian regions during a recent visit there. Eating pieces of fat isn’t really my thing, but I can appreciate how on those blistery winter nights salo can be filling and necessary to help keep the cold at bay. 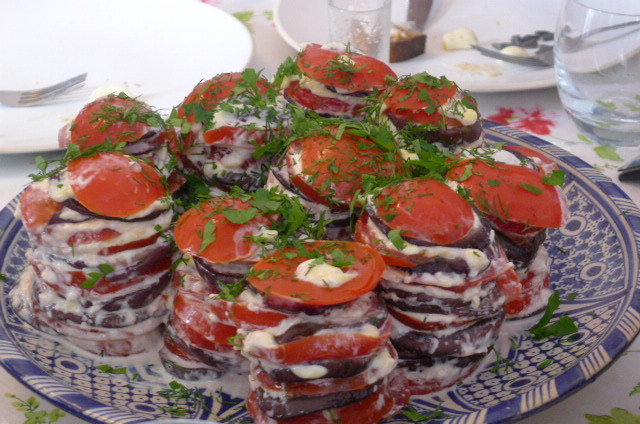 For starters we tried a Southern Ukrainian specialty – aubergine and tomato stacks which were absolutely delicious. Made from a recipe from Katrina’s mother, these lovely vegetables (sourced from Riverford Farm) had been layered with a luscious homemade and very garlic-y mayonnaise. 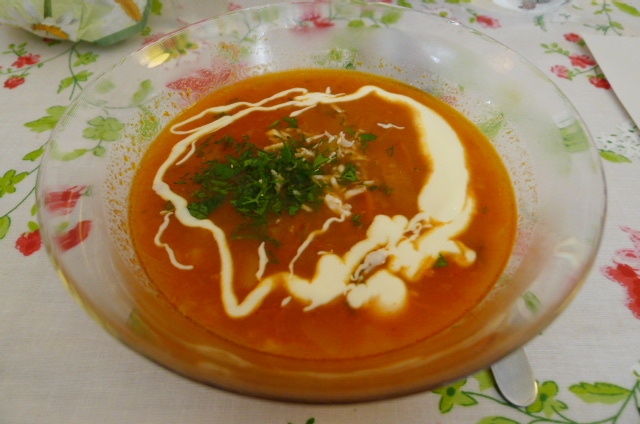 For a taste of the Donetsk region in Eastern Ukraine we tried borsch which had been prepared by Katrina’s Ukrainian friend Lyuba. The borsch was wonderfully tasty and refined. Interestingly, this borsch recipe did not make use of a lot of beetroot so wasn’t ruby-red, but it was lovely nevertheless. 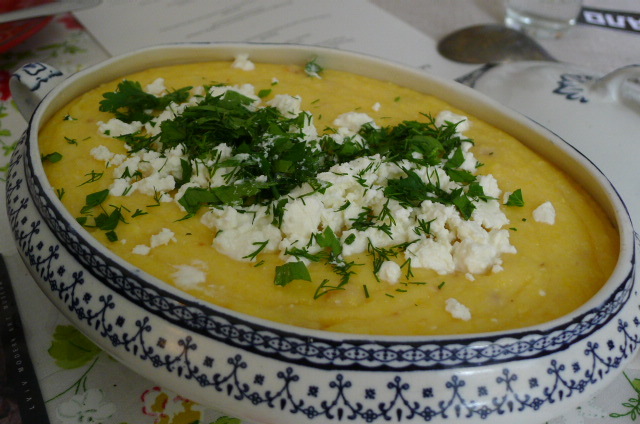 Banush, a Ukrainian version of polenta, is a dish made with corn (which grows plentifully in Ukraine) sour cream, cream, shkvarki (bacon bits) and cheese. This was creamy and good, and surprisingly did not feel heavy in the tummy. Next up was the pièce a résistance, Katrina’s (half) tribute to Ukraine’s mighty animal. 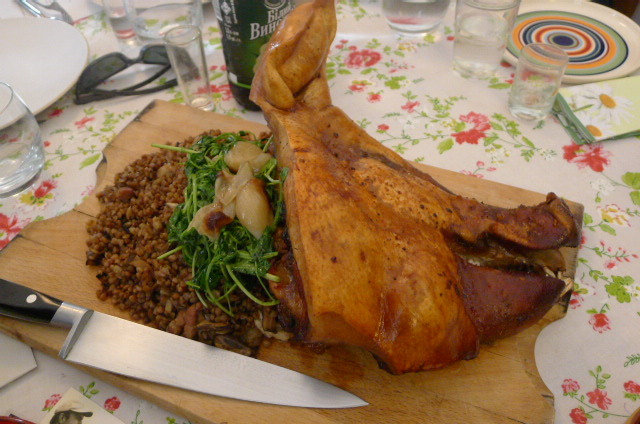 This turned out to be a half roasted pig’s head sourced from Rother Valley Organics served with buckwheat. A visual spectacle, the crackling was fantastic and super crunchy. There isn’t much meat in a pig head, but the meat was very moist and tasty. 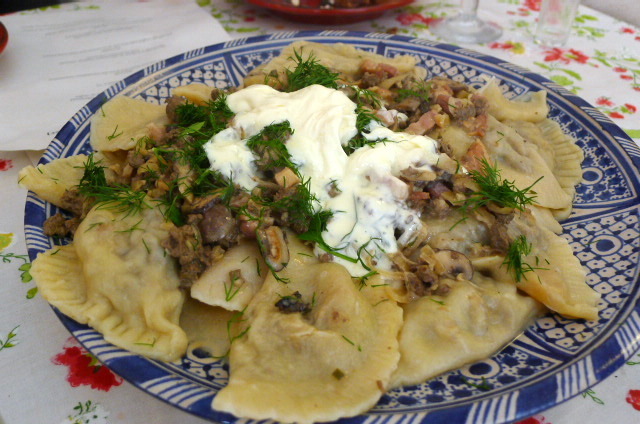 The final savoury course was vareniki, traditional dumplings filled with beef heart, liver, lots of onions, garlic, wild mushrooms. These were meaty and flavoursome and had been dressed with a mushroom sauce. 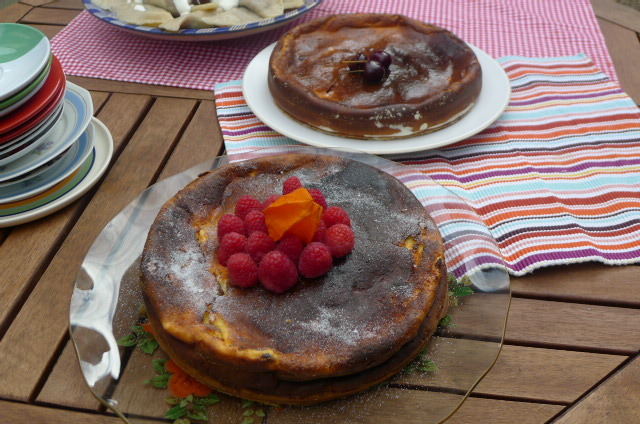 Desserts of cheesecake and syrnik, a Lviv cheesecake made with homemade (yes homemade by Katrina herself) cheese and poppy seeds were decent. Katrina went to great lengths to make her own cheese for the cheesecake. This meal took Katrina three days to prep. The ingredients were well sourced and the cooking delightful. The food was matched with shots of vodka, and all this only set me back £25. The company was good too. I was really impressed with every aspect of this meal. How wonderful! Oddly enough, there’s been a post about homemade vareniki dunplings sitting in my blog dashboard for a couple of months now. We made them in spring but it took me ages to write the post and then it was far too warm and summery so I held the post back until autumn, so it’ll be going up soon!